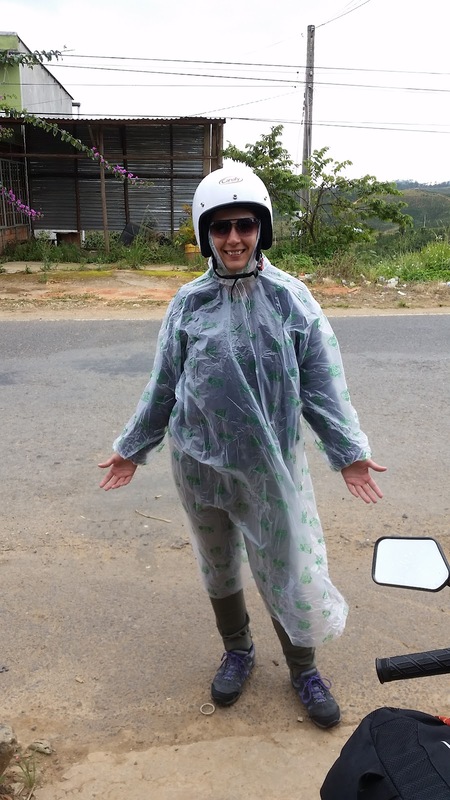 Convinced Ana to ride with me from Dalat to NHA Trang. Turns out we've all been saying "nah trang" but it's actually "National Heritage Area, Trang." Ana was on the fence and kept asking "are you sure you can get us both there? And all our bags?" I assured her I could. I had no idea if I could. I was just getting bored of traveling alone. Ride was uphill far more than it should have been at first, considering we were on top of a mountain and our destination was at sea level. Ana acted as copilot, pulling her phone out and directing me at critical turns. The bike chugged uphill and screamed as I engine-braked down, too afraid to pull the clutch and depend on brakes that could fail for a million different reasons. Road was in good shape but we got poured on. Couldn't get the visor to stop fogging up so had to just get drops straight into the eyes. Visibility went down to about 5 meters, maybe less. We crawled down the mountain, around turns I'd prefer to lean into and have a bit of fun at. 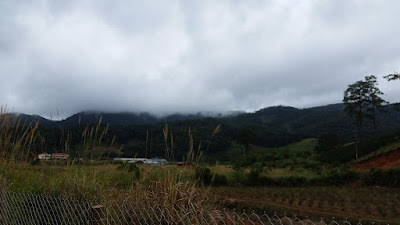 Clouds would part sometimes and we'd be treated to an incredible view of the mountain range, green fields below. She wanted to rest, I wanted to keep going. We rested near an unreadable sign and felt much better after. At the bottom of the mountain it turned out we had only used 1/4th the tank of gas, when I thought we'd be running out. 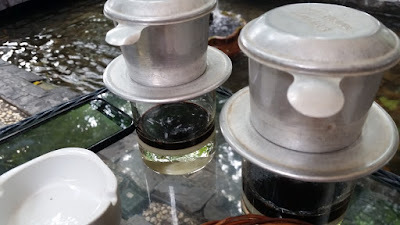 We rejuvenated with coffee and terrible instant noodles from a huge open-air shop. No matter where you are in Vietnam, the weather is always mild. As long as you have something protecting you from the rain, there's no need for doors or windows. 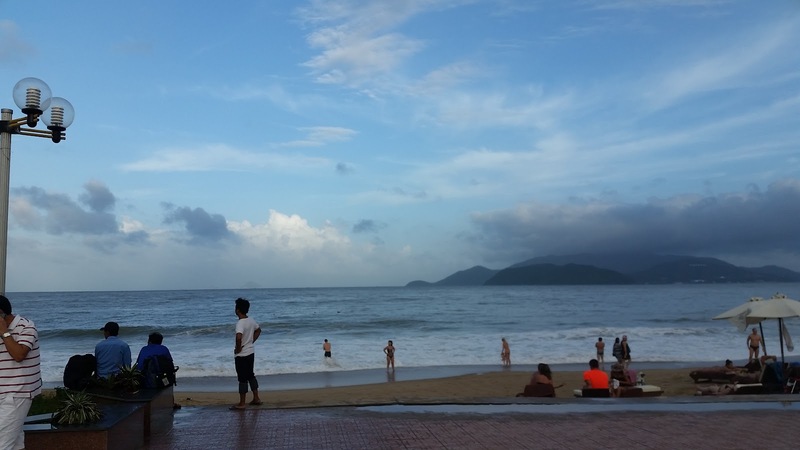 NHA Trang uninteresting to me, as I'd been spoiled by Moine. Ana liked it. Showed up soaking wet and miserable. We had a nice hotel with a hot shower and HBO. Met up with our UK friends that had left Dalat the day before, Louis and Hannah. Nice to see them again. 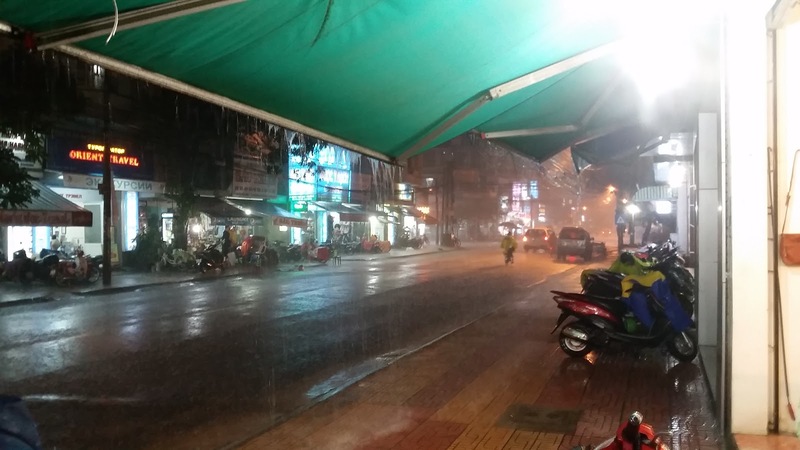 Streets were flooded from the rain as we ate in what was labeled as the best Vietnamese restaurant in NHA Trang. I had coconut curry in a clay pot, amazing. 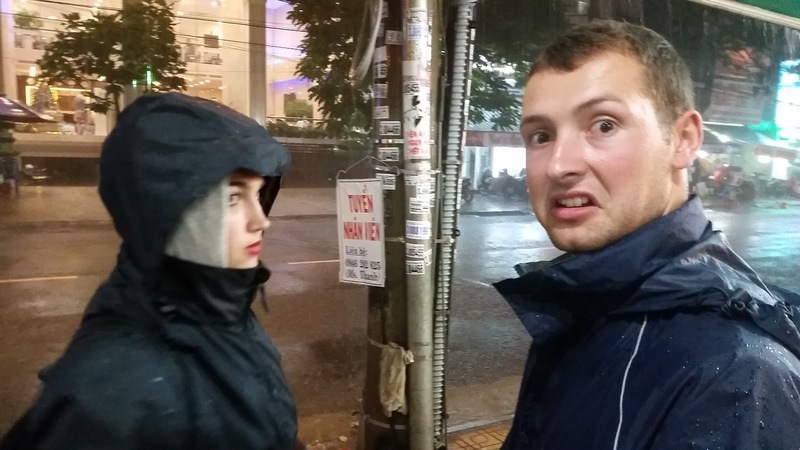 Louis and Hannah waded through the streets to their hostel, then the train station, to catch a night train to Danang. Power out the next day, no hot showers. 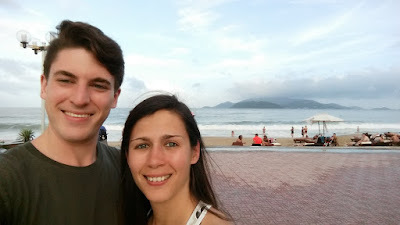 Got Ana in the highest rated hostel in Asia, went to the beach. They were nice, let me use their shower, try to blow dry my boots. Waves in NHA Trang massive, impossible to swim without getting tossed about like so much sea foam. Walked and talked, waited for the occasional rain to go by. 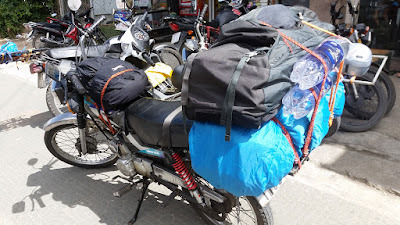 Nighttime, gathered my things, said goodbye to my three day friend and copilot, got on a night train for Danang. Was in a sleeper room with a Vietnamese family, little boy didn't understand what I was, young father kept offering me food. I got to relax and read, a welcome change. Woke up as the train was pulling into Danang, luckily. All my belongings still intact. Got off and hunted for my bike with a brother and sister that were traveling together. Found it, had to pay an "unboxing" fee, which involved them going into a garage and pulling my bike out. I asked them to reattach my mirrors they had taken off, since I'm paying anyway. They did so, terribly. Need to get them fixed up proper before the next leg of the trip. Starting to worry about time. Flight leaves in about 10 days, I'm a 5 day journey from Hanoi if I push flat-out. Lots of things left to see. "Little boy didn't understand what I was." I cracked up!